Converting a roof balcony of a 20 year old apartment building into a private roof garden. The client requested to provide 2 m. high bamboo walls around the garden to obstruct eyes of neighbors, a wooden deck, water supply and sink, and a storage for cleaning devices,a barbecue stove and a stereo set. Considering the wind load on the 6th floor,I decided to use galvanized steel frames to support bamboo walls. I did not hide the sub—frames but exposed them instead. I set up double layers of bamboo walls to create depth and to allow for free air~flow. 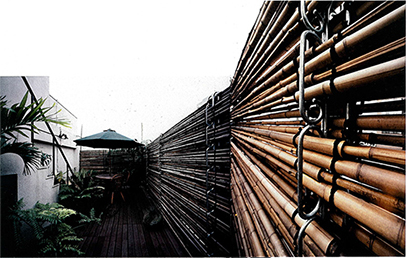 The wooden deck had to be lifted from the bottom so it drains better, Bamboo lasts approximately five to ten years, so it was necessary to provide a wall system which allow for easy exchange of bamboo walls while keeping the steel frame as it is. From these conditions I first thought of suspending metal parts from the existing handrail and fastened them with bolts, in order to fix the bamboo walls. I used 9 mm. steel rods and bent them like a paperclip,and put them together in X (cross) shape,so it provides enough strength and room for adjustment of location of bamboo. I collaborated with a gardener of traditional Japanese gardens and developed a new method of knitting bamboo walls at the site, them inserted them into the metal clips. 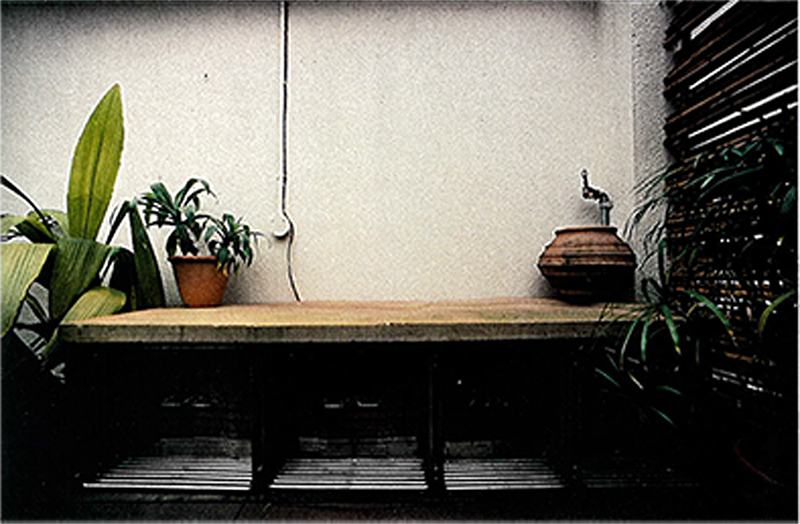 I designed a weather-proof cabinet so as not to distract the garden view,and used stone on the top board (which also serves as a chair). The other parts of the cabinets are mirrored stainless steel in contrast with the stone. Basically I intended to work on this project from the concept of 'inter-reaction of opposing factors to meet different purposes',as in the previous project "A Garden/ Endo House". And I successfully created a ‘global yet 'domestic‘ space.